GettyKim Jong Un and Donald Trump. US President Donald Trump left experts baffled when he said North Korea had agreed to destroy a missile-engine testing site, but it now looks as if North Korea is making good on that. North Korea says it will destroy a large-scale facility in Tongchang-ri, in North Pyongan Province, that was used to test engines for the Hwasong-14 intercontinental ballistic missile, South Korea’s Chosun Ilbo newspaper reported. The Hwasong-14 was the first North Korean missile that experts said could hit the US mainland with a nuclear payload. 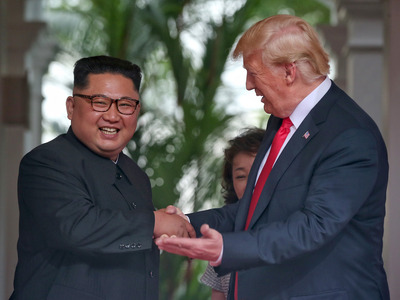 US President Donald Trump left experts baffled when after emerging from his summit with North Korean leader Kim Jong Un on Tuesday he said North Korea had agreed to destroy a missile-engine testing site, but it now looks as if North Korea is making good on that. “They secured the commitment to destroy the missile-engine testing site. That was not in your agreement,” Trump said in a press conference after the summit, referring to a joint statement that made no mention of concrete steps toward denuclearization. Trump’s statement at the press conference confused many and may have even divulged a bit much on the military intelligence side, but now reports of the details of the testing site have surfaced. North Korea says it will destroy a large-scale facility in Tongchang-ri, in North Pyongan Province, that was used to test engines for the Hwasong-14 intercontinental ballistic missile,South Korea’s Chosun Ilbo newspaper reported Thursday. “Kim Jong Un must have won a number of major concessions from Trump in other sectors in return for destroying such a major facility,” the source continued. North Korea did win several concessions from Trump, who agreed, also outside the joint statement, to stop joint US-South Korean military exercises, without first consulting Seoul. World leaders have praised the summit as a step toward peace and reducing tensions. Measures like the destruction of testing sites in North Korea, if monitored by US and international experts, could build the kind of trust needed to carry out earnest denuclearization.